We've had The Slow Cooker Recipe Book: Over 150 one-pot dishes for no-fuss preparation and delicious eating for quite a while now. It was a gift from LSC (see links to her recipe contributions at the end of the post). This is quite an informative and useful book, with chapters on slow-cooking basics (of course), useful equipment in the kitchen, information on beef, lamb and pork cuts, information on poultry and even game (such as rabbit and hare), prepping fish and shellfish, basic techniques for making stock, cooking soups and stews, making sauces, puddings, preserves... all in addition to the recipes within. I've been eyeing several recipes in this book since it came to be in our possession and finally, when we had some chicken in the fridge, I seized the opportunity. I had to choose something that would be friendly to all members of the household. Since this dorowat was cumin-free, I decided it should be "safe". 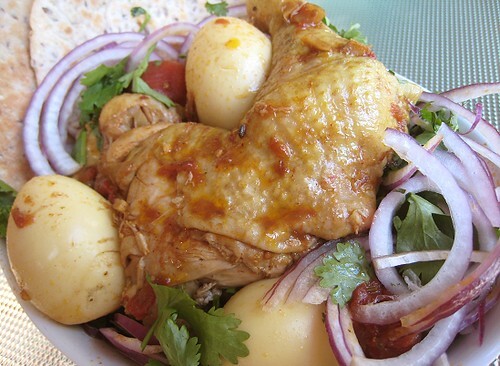 I've renamed this "Easy Dorowat" since the recipe seems to be a much simpler way to make this chicken stew. No need to make berbere (Ethiopian spice mix) and nit'r qibe (niter kibbeh; spiced butter), and the spices needed were minimal. It's more or less a dump-into-a-pot kind of affair, our favorite. I've adapted it for stovetop cooking as our slow cooker is actually too small to cook an adequate amount for the family. 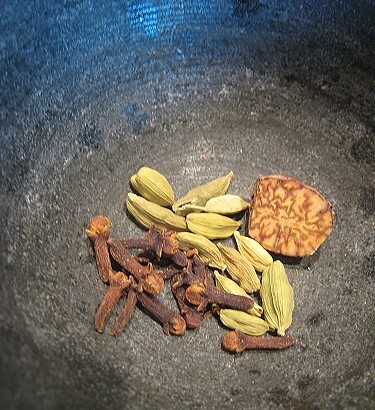 A "safe" blend of spices: cloves, cardamom, nutmeg, cinnamon and turmeric (not pictured). 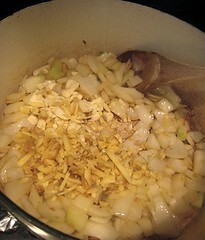 The dish starts with onions, garlic and ginger, followed by tomatoes. After the tomatoes have been cooking for a while, I added the spices. The chicken pieces went in next. I covered the pot and let the stew simmer. 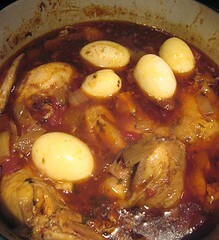 When the chicken were almost done, I added the peeled hardboiled eggs into the stew. Some sliced red onions and cilantro were needed to top the stew and it was done! You may have noticed that for photo purposes, I cheated and stuck in some "breakfast pita", which cannot/must not be mistaken for injera (Ethiopian bread). As this was supposed to be an "easy" wat (stew), we did not make any injera, but rather, ate the stew with plain white rice. Wow, we actually made something Ethiopian before! Heat oil in a large pan, add the onions and cook for 10 minutes until softened. Add the garlic, ginger and cook for 1-2 minutes. 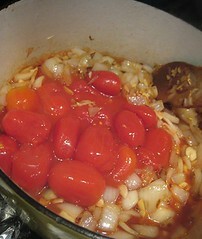 Add the stock and the passata/chopped tomatoes to the pan. 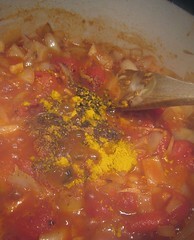 Bring to the boil and cook, stirring frequently, for about 10 minutes, or until the mixture has thickened, then season. Transfer the mixture to the ceramic cooking pot (of the slow cooker) and stir in the cardamom, turmeric, cinnamon, cloves and nutmeg. 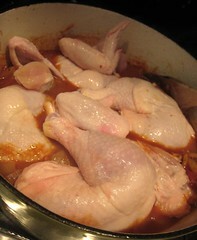 Add the chicken in a single layer, pushing the pieces down into the sauce. Cover with the lid and cook on high for 3 hours. 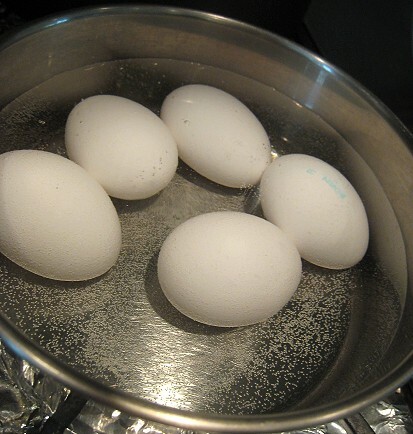 Remove the shells from the eggs, then prick the eggs a few times w/ a fork or fine skewer. 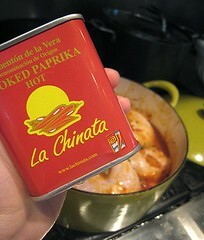 Add to the sauce and cook for 30-45 minutes, or until the chicken is cooked through and tender. Season to taste with cayenne pepper or hot paprika. 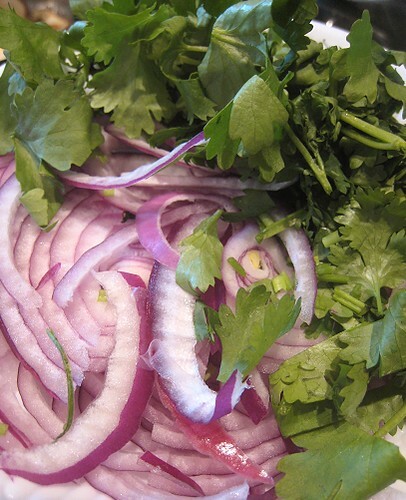 Garnish with cilantro and onions rings. 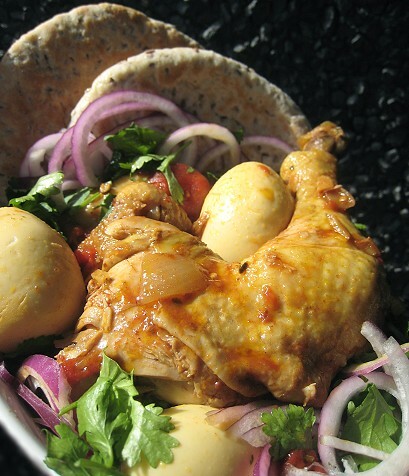 Serve with flatbread or rice. i adore doro wat, and this really tempts me. if only i lived in vancouver, then having you make it for me would make it even easier. 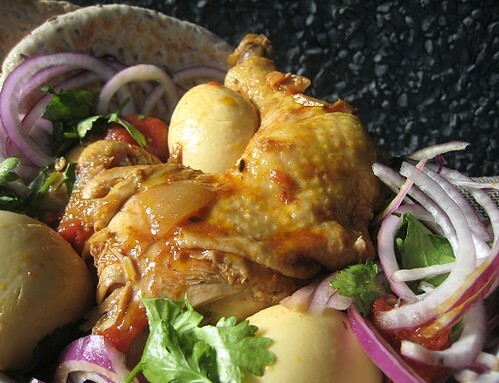 I love doro wat, but had only seen recipes that had way to many spices that I couldn't find. This seems totally doable. Looking forward to trying it! 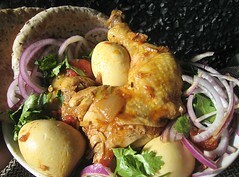 I did this for the Culinary Tour Around the World's stop in Ethiopia but went the traditional way with berbere. It was quite good as I recall though I haven't made it again. I like your dump-in-the pot-method. Cumin-free? I love cumin. I like Ethiopian wats too. I've been meaning to try making some simple Ethiopian dishes but the injera stumps me, and that's the best part! Your pictures are making me drool. What a vibrant and beautiful dish! 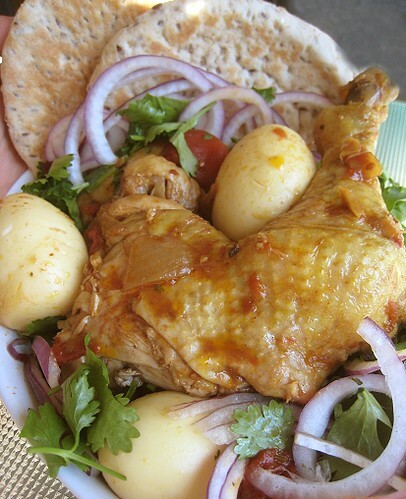 I'm a huge slow cooker fan - how can you say no to serving a hot dinner 5 minutes after you get home? Maybe it's not difficult, per se, as much as time-consuming? We are just lazy, though. I remember seeing your authentic version! Actually, JS and I have been reminded once again tonight *NEVER* to use cumin in our cooking.